In March we wrote a post about Katie Parla, our guide in Rome. 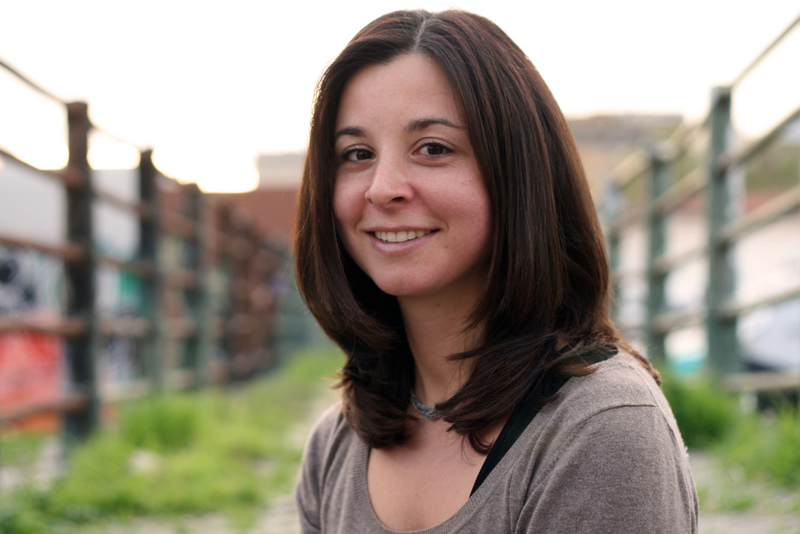 Katie is an American food writer, art historian, and guide residing in Rome. She is a regular contributor to The New York Times and The Atlantic, and has contributed to many guides by Fodor’s, Time Out, The Rough Guide, and National Geographic. Her blog Parla Food offers great insight into dining in Italy and around Europe, with a focus on Rome. What impressed us about Katie was her combination of mastery and humility. Her resume and breadth of knowledge is deeply impressive, yet Katie is unpretentious, down-to-earth, patient, and kind. It was a true gift to work with her as we led our group of Latin students around Rome, a city that had first captivated her when she was a student herself. When we asked to do an interview, she gladly agreed. When did you first visit Rome and why did you decide to live there? I moved to Rome in January 2003, around 6 months after earning my BA in art history. I decided to move there when I was still in high school. I loved history and the classics and took a trip to Italy with the Junior Classical League when I was 16. We did this insane bus tour that hit 13 cities in 8 days or something ridiculous like that. After about a minute in Rome I decided I needed to move there and that I could spend my life studying the city. What do you love about the way Italians live? What do you not love? 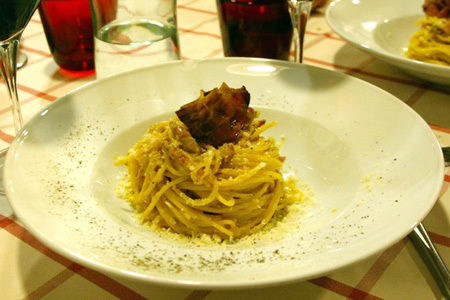 What should a visitor to Rome know about Roman restaurants? The customer is not always right. Just because you want balsamic vinegar and olive oil with your bread or grated cheese with your pasta doesn’t mean you are going to get it. Italian-American food customs are very different than those you find in Italy and servers won’t hesitate to refuse a request if it clashes with the local culture. The most important thing is to be flexible and follow the servers’ advice; he/she is usually right! When did you start your blog? What has your experience been with blogging? I started Parla Food in April 2009, after a couple of years writing very sporadic blog posts about living, eating, and drinking in Italy. I realized the old blog didn’t have a lot of interest, mainly because I wasn’t writing about a specific topic, but rather anything that came to my head. Blogging has connected me to so many fabulous people and places. I have met such inspiring food artisans, wine producers, and chefs as a result of blogging, not to mention all the interesting colleagues and readers I have had the chance to get to know. What do you miss about food in the States? The diversity! BBQ! Great burgers! Jersey corn! Raspberries! Great international cuisines! Please choose a favorite dish, and describe a few different preparations of it in different Roman restaurants. One of my favorite dishes is spaghetti alla carbonara. I have a top 3 list that includes three completely different approaches to the same dish. The first is at Roscioli, a gastronomic mecca in Rome where all sorts of posh ingredients, including eggs that go for $20 a dozen, are used to create a delectable amalgam which is tossed with high quality pasta from Abruzzo. At L’Arcangelo, chef Arcangelo Dandini makes the only carbonara that I know of that doesn’t employ black pepper. He is somewhat of a food anthropologist and his research has uncovered that the original carbonara recipe had cured pork, eggs, and pasta, but no pepper. At Da Danilo, the condiment is rather dry, not slick or partially liquid like it is at Roscioli and L’Arcangelo. This one is my personal favorite, simple, savory, delicious. What could Roman cooks learn from American ones and vice versa? I think Roman cooks have a lot to learn from a number of American food movements. Every Roman kitchen should be given a trip to Berkeley, CA for a crash course in the value of seasonal, local, and organic produce. Roman cooks need to be retaught about sourcing. There is a widely held notion that Romans/Italians only use the best and freshest ingredients. While this tends to be true at the upper end of the spectrum, the vast majority of kitchens employ pretty uninspiring pasta brands, foreign or out of season produce, and low quality cheese. That needs to stop. On the flip side, Roman cooks would never listen to an American about food. Trust me. Besides Lazio, what is your favorite Italian region? I can’t name just one! I love Puglia, Sicily, Sardgena, Campania, and Piemonte. We’re grateful to Katie for fitting in this interview between travels in Istanbul and Barcelona. If you’re going to Rome, do check out her mobile dining app. I just found this interview and wanted to tell you how much I enjoyed it. Glad you enjoyed it Carolyn! Katie is a good friend and treasure.